Showforce has been providing crewing support to LarMac LIVE at Creamfields since 2014. Year on year our involvement has grown. In 2017 and 2018, Showforce was the only crewing company employed by LarMac LIVE, this year the company fulfilled 770 crew shifts including 36 by licenced telehandler and cherry picker drivers. Showforce provided stage hands, backline crew, plant operators, crew chiefs and a site boss. 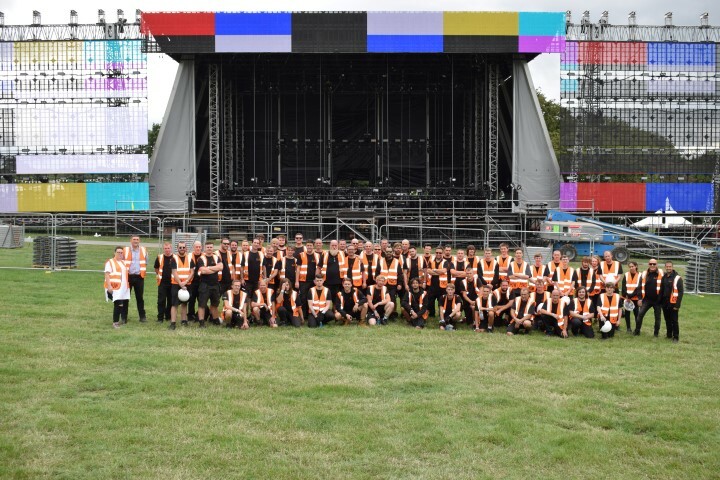 The Showforce crew were responsible for the load in of all equipment for every stage around the site, supporting the rest of the contractors: PRG, XL Video, Coloursound, Prism, Adlib, The Events Company, Christie, Capital Sound and Acorn who provided the risers. Throughout the build days rigging equipment was unloaded and fixed rigging points for the truss motors were installed on the festival’s larger stages, preparing for the installation of lighting and video rigs. DJ risers were unloaded and distributed around the site and telehandler drivers were on hand to move equipment and assist with front of house installations etc. As you would expect off a project of this size crew numbers change regularly to meet the demands of the project. Showforce’s operations team was well prepared and ensured that there were plenty of crew trained and accredited ahead of time. This meant that any last-minute requirements could be dealt with promptly and that the right crew with the right skills sets were available when needed. A dedicated account handler and operations manager were on-hand throughout with responsibility for all logistics, scheduling, accreditation and client liaison. On show days, Showforce deployed a dedicated team of crew for every stage, who redistributed and built risers for the various artists and a separate response crew that dealt with ad-hoc jobs around the site, as and when required. All the stages were extremely busy, and the calibre of the headliners meant that the changeover between acts needed to be executed to perfection on show days. Showforce utilised resources from its regional offices in London and Liverpool ensuring that it had experienced local crew available for the project to meet the large numbers required. Over the course of the project, the Showforce crew amassed an impressive 6528 man hours.